In this current situation of heavily fluctuating power supp lies, Voltage Stabilizer has bec- ome an unavoidable accessory forall precision and voltage sensitive electrical and elec tronic equipments. With stable voltage supply,electrical and electronic equipments produce optimum results and give long and trouble free service. 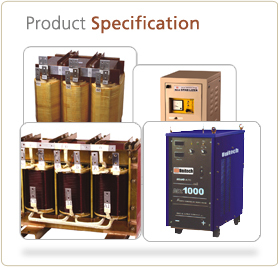 In every industry, most of the load is inductive in nature which results in lagging power factor. Hence, there is loss and wastage of energy which results in high power bills and heavy penalties from electri city boards. If the load is uneven it is very difficult to maintain unity power factor. To overcome this difficulty APFC panel is used which maintains unity P.F. We at ‘Unitech’ have developed the conventional type of welding equipments as well as the energy efficient inverter based welding machines for TIG, MIG-MAG etc.